With a rice cooker, you can easily whip this dinner time meal in about 20 minutes or so. I'd like to think of this meal as somewhat healthy. You have the complete proteins found in the quinoa, fiber found in the black beans and the corn...a nice little crunch? But in all seriousness, I think this makes a great meal; it's quick, good for you and doesn't taste bad at all. I make this meal using a rice cooker. 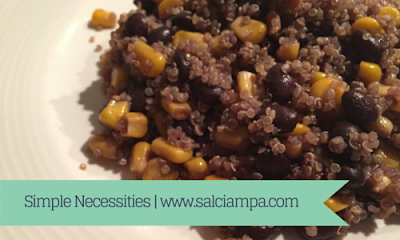 I just dump half cup quinoa, 1 cup water, half a tin of black beans and half tin of whole kernel corn. I like to drizzle in a little olive oil and salt to taste. Power up the rice cooker, wait 20 minutes, and your meal is ready to be served. And if you feel brave enough, pour some shredded cheese over top once plated.